Do you currently use Real Estate CRM software? At its core, the real estate business is the business of managing relationships—relationships between buyers, sellers, agents, brokers, developers, and financial institutions. The complexity and longevity of the home buying process present real estate with a set of unique challenges. A closed deal is represented by the sale of a property, but this closure depends on a nuanced process that goes beyond the typical customer-buys-product sequence. The term “customer” includes buyers andsellers, as well as other parties, with the agent or broker acting as liaison between them. The “product” is not an off-the-shelf good or service, but rather a distinctive property with its own defining characteristics. One of the most valuable tools for real estate agents is the customer relationship management (CRM) system. This guide will explain how CRM is vital to the success of real estate agencies and compare a handful of leading real estate crm software. Though the housing market is infamously volatile, the Real Estate industry has always fed from a steady stream of customers. In 2013, only 9 percent of homeowners sold their homes without professional real estate services, and 88 percent of buyers made their purchase through a realty firm. People will always need homes, and businesses will always need offices, which means there will always be a need to build relationships with professionals to find and purchase the best property. Despite the longstanding practice of relationship management in Real Estate, business IT systems have traditionally seen low usage. Nearly half of active realtors rarely or never use a CRM system or transaction management software. This could be attributed to a predominantly older population of agents and brokers—research puts the median realtor age somewhere around 57. But as a younger generation enters the workforce, and as buyers and sellers buy and sell earlier in life, we expect an industry-wide move towards technology-driven selling. Why CRM for Real Estate? CRM gives realtors an efficient way to manage contacts, schedule tasks, monitor their pipelines, and stay organized as they conduct business. In that sense, CRM is the scaffolding from which agents build successful relationships and close deals. Some agencies choose a generic CRM software and customize it to fit their operational goals, while others choose a CRM for real estate that gives them out-of-the-box functionality. This guide will compare examples of each. Wise Agent falls into the second category, meaning it’s been specifically designed for the real estate industry. The CRM is comprised of a suite of integrated tools for contact and transaction management, scheduling, marketing, and unlimited in-software document storage. Wise Agent also boasts “mouth dropping customer support, provide by real people that actually care,” which can sometimes be hard to find in a software product. Wise Agent’s contact management features are intuitive and simple. All communications are logged with time and date stamps. Agents can sync their contacts with Google and manage leads on the go with the mobile web application, which just received a facelift earlier this year. This system goes beyond basic contact management by also providing strong marketing automation features. Choose from hundreds of templates to create content, post to Facebook feeds, and disseminate with ease by using Wise Agents integrations with MailChimp and ConstantContact. Stay organized with Wise Agent’s custom, sharable task lists and appointments, call lists that sync with contact notes, and scheduled email alerts. Wise Agent is cloud-based and priced on a monthly subscription basis, although they do offer a free, no obligation 30-day trial. It may not provide some of the advanced capabilities of pricier products, but Wise Agent is intuitive, straightforward, and affordable. Insightly is one of the leading CRMs for small businesses across industries, and is a popular choice for real estate agencies because of its integrated project management (PM) features, social CRM, and mobile application. The software has three primary focus categories: customer relationship management, project management, and social CRM. For marketing automation, Insightly relies on MailChimp, which requires a separate subscription. Insightly gives you a robust package of tools for recording and managing contacts and related tasks (follow-ups, signing-events, etc.). You can perform quick, intuitive searches of your contacts, create custom fields, share files, create contacts with web forms, and receive automatic notifications. Closely related are the social features of Insightly: access contacts’ social profiles on Facebook, Google+, FourSquare, Twitter, LinkedIn, Picasa, and many others without ever leaving the CRM. Agents will find the integrated PM features particularly relevant to the property buying process, and this gives Insightly a competitive edge over other CRMs. You can specify roles, create automatic reminders, milestones, project pipelines, view reports, and attach files directly to the “project,” which would most likely be a residential or commercial property. Insightly is cloud-based and has its own separate mobile application. It’s easy to set up and administer, and the developers even provide a one-day, instructor-led course on mastering their product. Pricing is nicely scaled—the standard plan for up to 100,000 records is extremely affordable. Think Netflix-affordable. GreenSpot is a Denver-based real estate agency that works with buyers, sellers, owners, and operators through the buying and selling process. They use paperless methods and low-emission vehicles to stay environmentally friendly, which means a reliable CRM is crucial to their operations. Propertybase is a powerful real estate CRM software built on the Salesforce platform that gives residential and commercial realtors and property developers access to industry-specific tools, as well as core CRM features. The software was developed by real estate and brokerage experts and has a huge community following. In fact, it’s the highest-rated real estate app powered by Salesforce (yes, there are others). Propertybase is designed to help agents manage relationships throughout the entire journey from showing to closing. Enterprise-grade contact and lead management features let you capture leads from your website and route them to the right agents, track social media feeds, create detailed contact profiles, and build custom dashboards and reports. Since it’s built on the Salesforce platform, you’ll have access to hundreds of add-ons and applications if you need additional features. For instance, Propertybase integrates with Geoppointe—a mapping and geolocation add-on that helps you plan your day and get to the right locations on time. 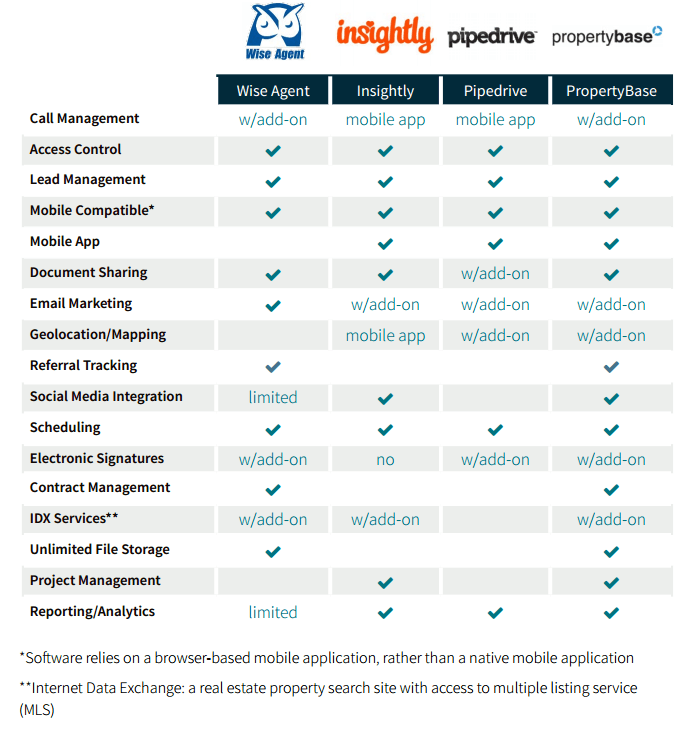 Propertybase is also compatible with a number of other popular apps, including Dropbox, DocuSign, Skype, PowerDialer, Quickbooks, Hubspot, MailChimp, and Zillow. Via Amazon cloud-hosted storage and Chatter, your team can store photos, pamphlets, flyers, and documentation directly in the system, as well as share and collaborate in real time. Propertybase is one of the few real estate-specific CRMs that offers functionality specifically for commercial real estate. Brokers can track comparables in their own database, manage deals, offers, and closings, and access powerful analytics and forecasting for commissions. Propertybase also offers inventory management for real estate developers. If you’re looking for an enterprise-level real estate solution, Propertybase will likely meet your needs. Pipedrive’s focus on the sales pipeline has made it an attractive option for many real estate agencies. The product being sold, of course, is property, and what better way to track the selling process than with innovative visualizations and pipeline tools? The cloud-based platform is intuitive and easy to customize, whether you need dashboards, reports, filters, or custom information capture fields. The sales pipeline helps you prioritize by displaying your properties and contacts according to different stages in the sales process. You can drag and drop deals in the pipeline view and focus on specific deals by imposing filters. Or you can view deals in a timeline layout to strategize task management and scheduling. Pipedrive integrates with Gmail, but you can also send and receive emails from directly within the system, which means they’ll be linked to relevant contacts and properties. There’s also a nice collection of popular add-ons that are compatible with the basic CRM, including Yesware for marketing analytics, RightSignature, MailChimp, Google Maps, and others. Pipedrive makes a point of its customizability —specifically the ability to disable and hide features you don’t need. That means no cluttered home screens with a bunch of buttons and tabs you don’t use. There’s only one edition of Pipedrive, and one price per user, per month, which makes the purchasing experience pretty easy. Pipedrive is a great option for smaller teams that want clean, simple CRM functionality. A recent study by ActiveRain revealed that “rich” real estate agents (those who make over $100,000 per year) are 87 percent more likely to use CRM software than “poor” agents (those who make under $35,000 per year). While this doesn’t necessarily provethe intrinsic value of CRM, it does represent a strong correlation between financial success and selling property on the shoulders of good technology. If you aren’t sure where to start shopping for a CRM or you’re unhappy with your current software, let us help you. We’ve researched all the leading solutions in order to bring you the best options, tailored to fit your real estate needs. Use the product selection tool on our site to get a personalized recommendation in seconds, or contact one of our in-house product specialists for a free consultation, no strings attached.